The best way to approach a Japanese aircraft cannon is first to identify it and then compare it with its counterpart among weapons that had been made for years in other countries, such as Hotchkiss, Hispano-Suiza. Oerlikon. Browning, or Vickers. The similarity in operating principles will usually be very apparent. 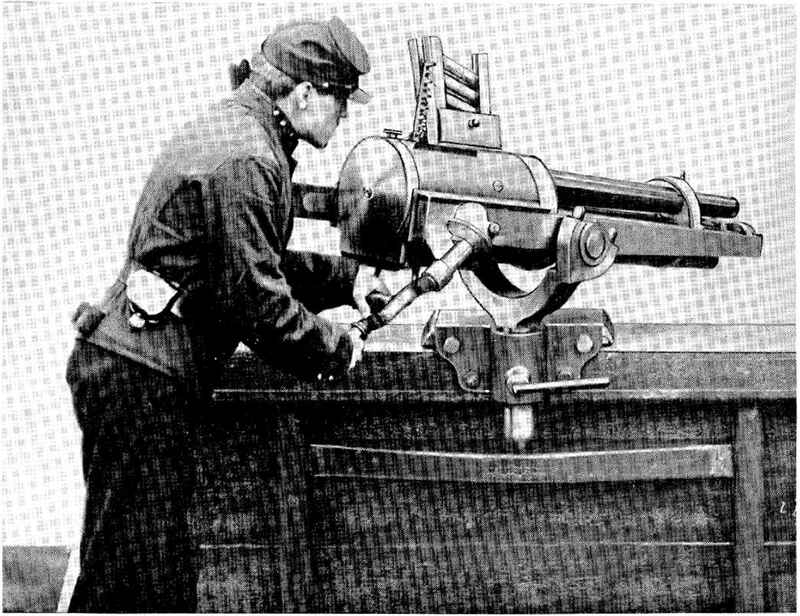 The most outstanding example of such borrowing is the 20-nun automatic gun given the designation IIO-5B. It. was simply the successful caliber .50 Browning machine gun made in 20-mrn bore by copying an American weapon captured in the early stages of the war. According to official documents found after the Jap surrender, this condition was the result of Jap anese confidence in their 7.7-mm rifle caliber machine guns and 20-nun Oerlikon-type cannon. It later became apparent that a quick victory was not possible and that there was a pressing need for larger bore auiomatic weapons and for higher rates of fire and greater velocity. Con sequently. they copied and put into production whatever was most readily available. After their successful conquest of the Philip pines, the Japs captured thousands of our Browning machine guns and upon this reliable mechanism they based practically all wartime cannon development. It was first made in 13 millimeter» and then raised progressively to whatever bore was demanded. These were all designated HO with the Type and bore diameter following, sucl as HO 103 13 mm, HO 5 20 mm. HO-15: Type 1, 30-mm. and 110-204-37-mm. Of the» the HO-5 was the most successful. During the! latter days of the war it was the air force's first! line 20-nun aircraft cannon. 20-mm Automatic Aircraft Csr.non, Model H05.